A lot of websites have been up for some time, unchanged, unaltered, some of these can look a bit “stayed” or “very eighties” in appearance. EuroByte can revamp your site, modernise it, improve it, incorporate new features which probably weren’t even available when the site was originally published.We can work to your instructions, your time scale and most importantly, your budget. Even if the existing content is Ok, your situation may have changed in terms of the products or services you offer, and these changed may not be reflected in your website. We can incorporate your corporate identity, your own photographs, or photographs especially taken for the site, online enquiry forms, the list is extensive. 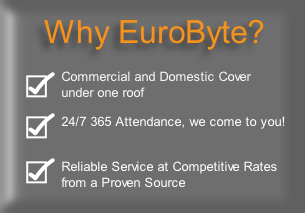 EuroByte Computers will respond quickly and sympathetically as soon as you ask for help, evenings, weekends, Bank Holidays, they don’t exist for your computer or your laptop, so they don’t exist for us either. Computer or laptop repair? We’ll be there! We are experts in the field of data recovery, so pictures of Grannies' last Christmas, or those baby photos you’ve been meaning to back up for the last couple of years have a better than fighting chance under our protective wing. If you’re just starting out, need to expand, or if you’ve taken over a business who’s IT is in a bit of a mess, we can listen, source, help and advise. We can source the machines, the software, we can build and install, set up the network, liaise with the broadband suppliers, set up the emails. We can oversee the creation of a Virtual Private Network, allowing key personnel remote access to work from home, holiday, anywhere in the world in fact. We can monitor your backups, provide 24/7 365 Service Cover, loan machines in the event of failure. We can repair computers, we can repair laptops. We can upgrade laptops, we can upgrade computers. In short, we can work overtime to go the extra nine yards to ensure your I.T. setup does what it’s supposed to do, and whenever it’s supposed to do it, integrating seamlessly into the fabric of your office, there as a tool to serve you, not as an ogre to dominate and stagnate you! EuroByte Computers are your one stop Computer Support Company for all aspects of Office and Home computing. From Computing to Web Presence, EuroByte will advise, lead and deliver. From advice on your requirements, bespoke hardware construction, computer installation, instruction, computer repair and Disaster Recovery, EuroByte Computers are with you every step of the way. When a web presence is appropriate, we can advise, help design, host and maintain your site, from an annual “touch-up” to weekly updating, social media inclusion, whatever you need, whatever it takes, EuroByte will deliver 24/7 365. If you need to know about our computer or laptop repair service, click here!